Here's a few of my favorite party ideas from fellow bloggers. Red, Blonde, & Burlap shared how to make Cardboard Cut Outs for your next party. I love this idea. 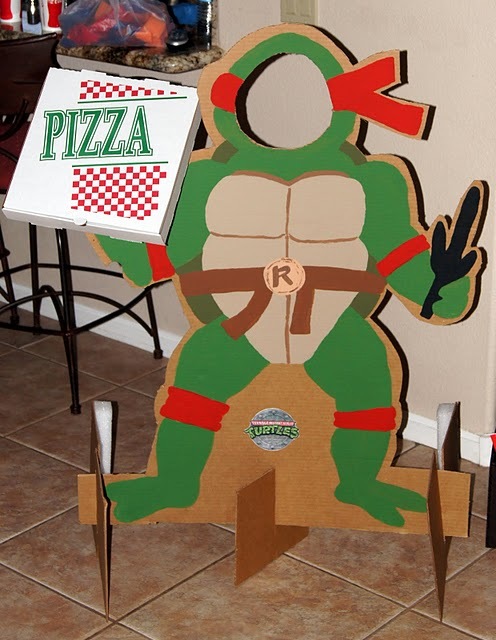 I am hoping to make a few of these for my Alice in Wonderland party, but hadn't thought about using cardboard boxes. So smart. I do want to find a projector since I can't draw at all...so this might be a little difficult. But once I find that it should be pretty easy to make a bunch of these. Sun Scholars shared this amazing Watermelon Shark. Wouldn't it be perfect for a summer party or swimming event? I love watermelon and this would be a great treat to have at any party. I really don't have a lot of decorating talent when it comes to food, so I'm hoping I can figure out how to make it. And if not, I'm sure I'll have LOTS of watermelon to enjoy if I goof! 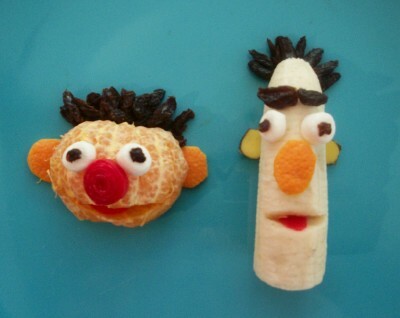 Kitchen Fun with My 3 Sons shared this great Ernie and Bert Fruit Snack idea. I just love how cute these turned out. They look so fun and yummy to make. These would be so cute to have at a Sesame Street part on the table as an alternative to sweets. I'm sure the kids would eat them right up! LOVE IT!! That's My Letter shared her guest post on how to make a Playdough Wreath. Isn't this wreath just so pretty? I have determined in the last few months that I really have a "thing" for wreaths. I never did before...maybe they are just getting too cute to ignore anymore. They aren't these huge ugly circles of fluff on the door anymore, they can be so original and inspiring....and so perfect for a party theme. Wouldn't this be fun to hang outside your art party? 2 Little Hooligans shared how to make Ice Cream in a Bag. We were just craving homemade ice cream last night and mourning the loss of our ice cream maker. I absolutely LOVE homemade ice cream but never make it. It's just so much easier to go to the freezer and get the store bought stuff. But this looks pretty easy too and would be a fun summertime activity for my kids. How fun would it be for each of the kids at your birthday or 4th of July party to make their own ice cream for dessert? That would be so awesome!